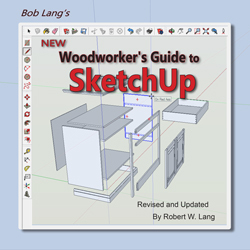 Thank you for purchasing the “New Woodworker’s Guide to SketchUp”. This page exists to provide answers to frequently asked questions about this book, and to help resolve any technical issues. Most of this information also applies to my other books in enhanced PDF format. Click here for “SketchUp for Kitchen Design” technical support. If you are using Windows 10 and a new installation of Adobe Reader, click here for the quick fix. Make sure that you downloaded the entire file. It’s a big file 1.4GB and it takes awhile, depending on the speed and quality of your internet connection. The link you receive with your purchase will give you several attempts. The service I use recommends this software http://www.freedownloadmanager.org/ to speed up the download and restart it if it is interrupted. There might be a few settings in Adobe Reader that are causing the trouble. 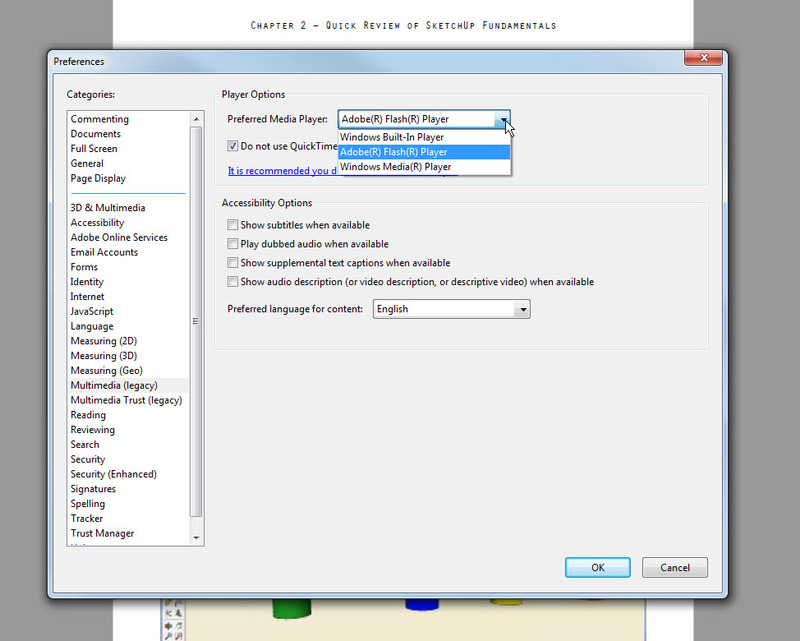 Adobe Reader Preferences are found in the Edit menu. Select Multimedia Trust (legacy) and make sure the box that allows multimedia operations is checked. Multimedia (legacy) allows you to select a preferred media player. Try changing the selection. If you make any changes to Adobe Reader Preferences, close the program and restart it to make the changes stick. It is also a good idea to restart your computer after updating and changing the Preferences settings. You can report problems by leaving a comment below, or send an e-mail to report your issue. GOOD NEWS FOR iPad USERS! THERE IS NOW AN APP THAT SUPPORTS THE VIDEO CONTENT IN MY BOOKS WHEN USING YOUR iPad. Some more information would be helpful to get you going, type of computer, operating system, etc. 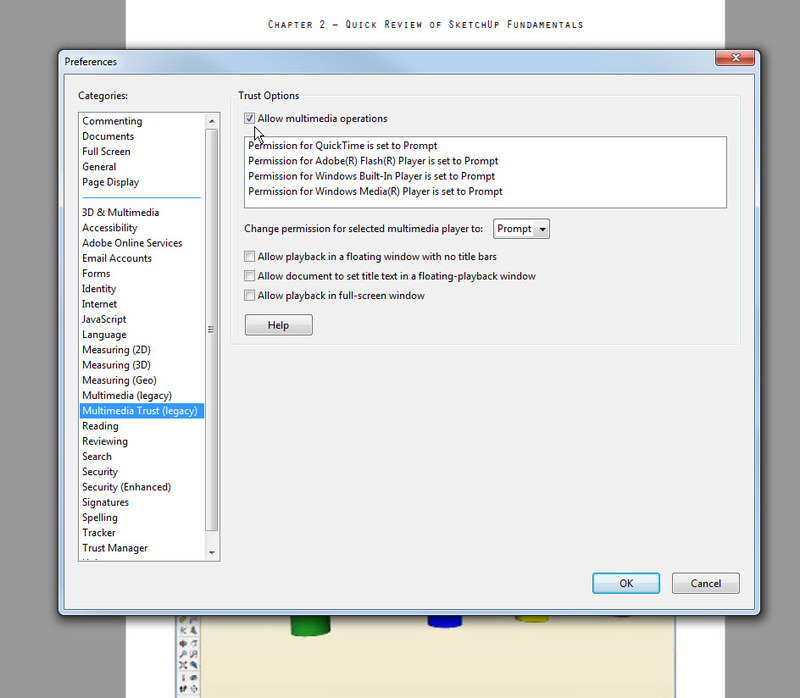 Are you using Adobe Acrobat Reader to access the book? If you changed any of the Preferences in Reader, exit the file and the program and then reopen. Have you checked the settings suggested in Chapter 1? It might help to set QuickTime as the default media player if you are on an older Windows machine. After you installed Flash, did you close and re-start Adobe Reader? If not, give that a try. Sorry that you had issues with this. The file is quite large (1.4 gigabyte) because of the video content. Numerous things can happen during a download and a hiccup anywhere on your machine or in your internet connection can cause a problem. The service I use recommends this software to speed up and resume downloads of this size. The service sends a link via e-mail when the transaction is complete. That link will give you a few attempts before it shuts off. If you have an issue and your link no longer works, send me an e-mail and I’ll send a new link as soon as possible. I try to keep a close eye on the inbox, but I do need to sleep sometimes. I’m in the Eastern time zone in the United States. Keep that in mind if you’re in China and sending an e-mail every five minutes. I just downloaded and I’m using my iPad to read via iBooks… I also have a PDF reader app I can use. I can’t seem to see the video on my iPad or on my Mac. Any suggestions? The publishing software that I use only plays the videos when the PDF file is opened with Adobe Acrobat Reader on a computer. If you’re on a Mac, “Preview” will open the PDF so you can read it, but you need to download and install Adobe Acrobat Reader to view the videos. The videos don’t function on the iPad or other tablets. I’m testing a new format which is browser based and allows the videos to work on tablets. That format is still in the developmental stages, you can read about it (and take it for a test drive) in this post. I just learned of an app that allows the video content to play on the iPad. Purchased the dvd on Kitchen Cabinets. Cannot get the videos to play. Am running on Windows 10. Sent you an e-mail. For others experiencing this problem try updating Adobe Reader, Flash and check the settings in Adobe Reader Preferences. Sorry that you’re having trouble. Do you get this message when you click on a video in the book? There is also a window in Reader Preferences where you can designate a video player to use. It might work to select something other than what you have now. I used to learn PDF using the highlight function of acrobat in order to create a summary of comments. Unfortunately the pdf is protected and it is not possible to use the handy highlight and commentar function. Would it be possible to reduce slightly the level of protection of your document in order to enable these handy tools? Thank you for pointing this out. I’m in the process of fixing this, but it takes a while for the upload. I will send you a fresh download link when the new file is ready. and I will send you a fresh link. Any one else had this problem? I’ve email the support address and am awaiting a reply. I run windows 10, tried edge, firefox and turned off smartscreen and other browser protection, that didn’t fix the error. I managed to get the file to Al through other means, just wanted to put this out in case one of my readers has an idea. If you’re having issues, the quickest way to get through will be to send me an e-mail. Click this link to do that.